Mac-heads rejoice, your gaming trough just expanded by several dozen on-demand titles. That's because Steam is here at last. Valve says its digital download gaming client just went live, and you can pull it down here. What's more, they're giving away Portal, free, as part of a special launch deal. Portal, in case you hadn't heard, is the company's euclidean-space-warping, first-person whatchamacallit. "Portal used to cost money," reads Valve's promo page. "Until May 24th, it's free. End of story." "Well, technically speaking, there are some strings attached. Fortunately, they're entirely decorative. We just like the way they look, swaying in the gentle breeze created by a million people simultaneously fainting from shock at the news that Portal is free. 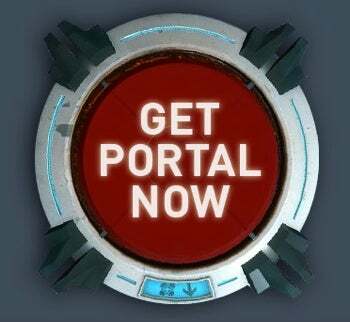 Now you have no reason not to try Portal." The client DMG file's about 2.7MB, but it may take awhile to grab (it took me nearly 10 minutes) due to preliminary demand. Once that's installed, you'll still have about 33MB to pull down automatically. The initial games list seems substantial enough--see here for all 57--and Valve promises "a new group of games highlighting an area of Steam functionality" will be released each Wednesday. The current 57 highlight Steam Play, Valve's way of referring to their buy-once, get-all-platforms-free policy. Windows gamers who've bought Civilization IV: The Complete Edition, for instance, should already own the Mac version, gratis. Valve president Gabe Newell chimed in, praising the Mac platform and claiming "this is the beginning of a groundswell of games coming out for and fully utilizing the openness and power of the Mac." Openness? Maybe not, given Apple's predilection for locking up hardware (the iPhone and iPod), application banning (Google Voice, Adobe Flash), and vigorous patent litigating. Then again, 57 games with new stuff each Wednesday and a freebie in the bargain? They had me at '57'. Update: It looks like Steam dumps everything that isn't the app itself, e.g. game files, preferences, related settings, etc. into your Mac's 'Documents' folder. What a mess! For this, I dismiss apps like Microsoft Office 2008 out of hand. Come on Valve, you can do better. Create a 'Games' directory at root, or a subdirectory in the 'Applications' folder. Pouring everything carelessly in the 'Documents' directory messes up backups, clutters stacks, and frankly butts in on sacrosanct digital turf. Fix, please?